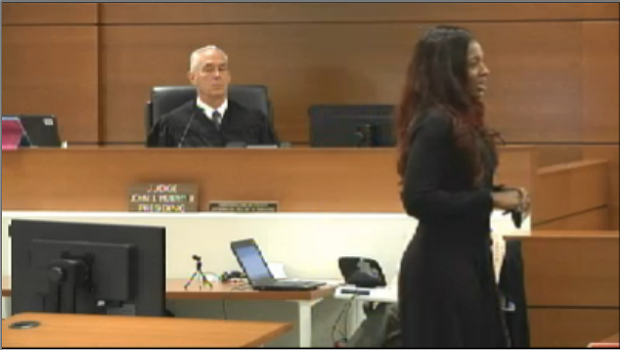 Lakiesha Cannon delivers her opening statement in Santoro v. R.J. Reynolds, et al. Fort Lauderdale, FL—A woman’s hopeless addiction to cigarettes was driven by tobacco deceit that led to her fatal lung cancer, an attorney for the woman’s widower said during Tuesday's openings of a rare Florida state court trial against three of the nation’s four largest cigarette makers. Santoro v. R.J. Reynolds, et al., 2008-CV-025807(19). “She loved her family. She loved her husband. But she could not stop smoking,” Lakiesha Cannon said of Grace Santoro, 66, who died from lung cancer-related complications in December 1998, after nearly fifty years of smoking. Her husband, Charles Santoro, claims tobacco giants Philip Morris, R.J. Reynolds, and Liggett are responsible for his wife’s death by hiding the dangers of smoking through most of the 20th century and hooking Grace Santoro on their cigarettes, which ultimately caused her cancer. Cannon walked jurors through the tobacco companies’ decades-long participation in an alleged marketing scheme to cast doubt on the scientific evidence of smoking’s dangers as they marketed a product they knew was addictive. She said Grace Santoro was caught in that scheme, which drove her to smoke throughout her life. However, while Philip Morris and Reynolds, the nation’s two largest tobacco companies, are common defendants at Engle trials, Liggett appears relatively rarely. The company, the fourth largest cigarette manufacturer in the U.S. has settled most of the pending Engle litigation against it. Liggett last appeared in front of CVN cameras for an Engle trial in 2015, a defense win in Shulman v. R.J. Reynolds. Explaining that she did not wish to repeat the issues raised by the other defense attorneys, Liggett’s attorney, Kelly Anne Luther, of Kasowitz, Benson, Torres & Friedman, declined to give an opening statement.